Based on reviews from 62 experts and 6,957 users. Learn how our rankings work or see our guide to high football boots. Updated Apr 2019. A flashback to the history of football will prove to us that high top football boots are not a 21st-century trend. The original soccer boots that were invented were all made to have ankle support. High top football boots have been prevalent as early as the 1500’s. The original soccer boot was claimed to have been invented in the 1500’s. It was created by the shoemaker, Cornelius Johnson. King Henry VIII was the first one to wear it. The pair was described to be ankle high and was made of heavy leather. In the 1800’s when soccer was popular in Britain, the first boots with steel toe cap, metal, and laces were created. Several years after, the first ever boot made specifically for football was made. Both shoes were designed with ankle-high support. In the late 19th century, there was a high demand for competitive football boots. It was then the start of the one of the most significant evolution in soccer cleat construction. A shift from a boot-style shoe to slipper-type began. From the 1940s to 1960s, the demand for ankle-high styled cleats declined. In this era, many were more concerned with comfort and performance rather than protection. By the end of the 1960s, most of the boots were constructed with lower-top. Fast forward to the 21st century, high-top boots have once again emerged and are now prevalent even in the most current models. The technology has dramatically improved the ankle support. Several manufacturers including the footballwear behemoths, Adidas, Nike, and Puma have produced high top football boots that are built for comfort and performance. As of 2017, only Nike and Adidas offer high top football boots. Puma, on the other hand, provides mid top and low top football boots. Soccer cleats brands such as Asics, Diadora, Lotto and New Balance feature low top football boots. Under Armour offers high top football boots engineered only for American football. Dynamic Fit is a collar built from a stretchable sock-like material. The concept sprung from the Nike design team’s goal to build a lock down element in a high top football boot. They wanted to develop a technology that would work harmoniously with Flyknit to enhance the barefoot feel. The innovation is engineered to create a glove-like sensation, securing the foot from the ankles to the toes without any disruption. With the Dynamic Fit, the lower leg, the foot, and the ankle are meant to synchronize to produce natural movements. Feedback from prototypes revealed that the collar made players more confident and cognizant of their physical interaction with the ball and the ground. Contrary to the usual boot extensions, Dynamic Fit is not mainly built for ankle support. The revolutionary sock-like collar serves to lock in the foot securely to avoid those unwanted slippages internally. Additionally, it was developed to heighten the next-to-skin touch for the ball. The Nike Mercurial Victory VI, Nike Mercurial Superfly V, Nike Hypervenom Phantom III Elite DF, Nike Magista Proximo II Indoor are just some of the football boots from Nike with Dynamic Fit collar. The collar installed in the Magista Obra II Elite DF boot is uniquely contoured to conform to the shape of the ankle bone. Around the ankles, it has a thicker and more stable construction than any other parts of the collar. The area can be easily distinguished with its contrasting color inspired by the idea of heat maps. The design is meant to offer more comfort in the said portion compared to other DF types. The Achilles tendon area is structured to be lowered, forming a V formation from the rear view. It is shaped that way to prevent the possibility of blister formation as the skin in the said area is exposed and is not rubbing into the DF fabric. The same collar is found in the following Magista soccer shoes: Obra SG-Pro Anti Clog Traction, MagistaX Proximo II Turf and Indoor, and Obra II AG-Pro. The Dynamic Fit found in Nike Magista Obra 2 DF Academy is an extension that offers a sock-like fit. It is not as stretchy as the other collars in the Magista series but is meant to provide stability as the ankle pivots. The Nike Hypervenom Phantom 3 DF Academy and Mercurial Victory VI are some the soccer shoes designed with the said collar. The Dynamic Fit seen in Hypervenom Phantom is distinctly patterned to look as if the collar’s medial side is longer than the lateral side. Its angular opening produces a glove-like fit in the lower leg for secured lock down. The sides have ragged knitted ridges that can expand like a rubber band to slip the boot on comfortably. It also doubles as a lockdown element, giving the foot more room for stretching while in motion. The Artificial Grass version of Hypervenom Phantom DF is installed with the same collar. Other boots with the same extended collar are HyperVenomX Proximo II and Hypervenom Phatal III Elite DF. The Nike Hypervenom Phantom 3 DF Academy carries the same Dynamic Fit collar found in Nike Magista Obra 2 DF Academy. It is a knitted collar that extends through the instep to mimic a sock-like response. The extended collar found in Mercurial Superfly V features the original version of Dynamic Fit. From the side view, it is longer than any other Dynamic Fit variations. The construction is engineered to primarily produce a natural sensation from the lower leg by giving a snug and non-restricting fit. It provides a tightness that does not impede foot movements, brought by the elastic ridges in V-formation. Mercurial Veloce III Firm Ground, MercurialX Proximo II Turf and Mercurial Superfly V AG-Pro high top football boots from the Mercurial line up has the same kind of Dynamic Fit collar. The Mercurial Victory VI Firm Ground is built with a collar similar to Magista Onda II Firm Ground. It is constructed mainly for ankle support. It is also seen in its turf and indoor court version. Two of the several categories of Adidas football boots are built with collars that are meant to offer a sock-like sensation. These high top football boots are tailored to provide ankle and lower leg comfort and stability. Contrary to Nike’s collar style, the high top football boots in Adidas are produced as a one-piece construction and is not a separate part of the ankle area. Sockfit is Adidas stretchy collar that extends from the ankles to the toes. As what the name suggests, it is engineered to mimic the sensation from a sock, a foot-hugging feel. However, it has been innovated to a more durable version of an ordinary sock through its thicker but breathable texture. A variation of Sockfit is seen in Predator 18.1 Firm Ground which features Primeknit. It is Adidas exclusive knitting technology that is digitally engineered to produce yarns that allow flexibility in the ankle area. Overall, it is a lightweight material that wraps the lower leg comfortably. All football boots in the Predator line-up are manufactured with Sockfit. How would I know if high top soccer cleats would work for me? Choosing between low top and high top football boots boils down to a matter of preference. It is not necessarily built to enhance a player’s performance but it works best if you feel comfortable wearing it. One of the things you need to consider is if you prefer the look of the boots with a high collar. You will feel more at ease if you personally like what are you are wearing. Secondly, a high top football boot offers a distinct type of sensation when worn. You need to determine if you are more comfortable with a sock-like feel that covers a portion of your ankles or lower leg. A high collared boot provides a seamless sensation due to its one-piece construction. It feels more of the boot wrapping your foot as opposed to being strapped around. The breaking in process also helps to reach that comfort level you desire. It’s not just the footbed and the toe box that require breaking in. Getting used to a collar is also crucial. If you prefer more padding in the heel area, then a high top boot may not be for you. High cut cleats are usually designed with firmer heel counters due to the installation of the collars. What are the differences between low top, mid top, and high top football boots? The terms have been interchangeably used by many, but just like any other contrasting concepts, there is a thin line between the definitions of mid top and high top collars. It is due to the almost unnoticeable difference between the two. Mid-cut collars are said to offer coverage until the ankle level. High top football boot, on the other hand, extends through the lower leg which makes it longer than the mid-top version. For top sportswear brands such as Nike, a mid-cut collar variation does not exist. Boots from Nike are categorized into either low top or high top football boots. Adidas has high top football and mid-cut variations but does not necessarily label it as such. They simply describe it as a collar. The Predator 18.2 Firm Ground is a high top football boot identified through its full ankle coverage while the likes of Adidas X 17+ Purespeed Firm Ground is a mid-cut boot as it does not cover the ankles completely. Low top boots are easy to spot as they are the usual soccer boots without any extensions or collars. How to fix a loose Dynamic Fit collar? Tie the excess portion of your laces around your ankles, wrapping the lower leg with the laces. Start the lacing either from the back or front of the lower leg, whichever you prefer. Position the tie-in line with the Achilles to create that snug fit. Form a secure knot with the laces. Fold the collar over the laces and adjust it according to your preferred fit. How do I cut the Dynamic Fit collar in my Nike football shoe? Amateur and professional players who have opted to cut out the Dynamic Fit collar from their Nike high top football boots do it for reasons, such as discomfort and pain. They felt that the collar was too constricting for their lower leg and that it eventually caused them blisters. Some felt discomfort due to the loose ends due to overstretching. The reason for the discomfort one may feel may not necessarily be coming from the collar. At times, it can be mistaken as a discomfort element when other factors such as the heel counter or heel fit may be causing it. Cutting the collar off may not significantly increase the comfort of the boot. If the collar was not cut thoroughly and resulted in uneven edges, the cut portion can’t be sewn back. The procedure may end being counterproductive, and one may end up trashing their high top football boot away. More importantly, it will not be qualified for a possible replacement as per Nike’s return policy. Nike’s warranty team will not honor any durability complaint once a boot has been deliberately altered such as cutting the collar off. The knitted rims of the cut portion are highly susceptible to even more damage due to its ripped stitches. Once those edges are cut, there is no way to seal it back to its original shape. Consequently, the knit will start to potentially fray from the heel to the upper area. The collar is built to promote a natural sensation of the high top football boot being an extension to the foot. Without the collar, the extension below the laces will feel loose and unstable. Removing it defeats the purpose of secured lock down. What is the Adidas Primeknit FS? Is it a high top football boot? The concept of Adidas Primeknit FS was launched in 2014. It is the world’s first-ever knitted cleat with a sock hybrid. The one-of-a-kind innovation features a sock extension that reaches up to the calf. By far, it has the highest collar ever to be placed on a soccer cleat. Up to this point, Primeknit FS still remains to be a concept and has not gone past the design stage. The idea was hyped during the release of Nike Magista series. Are high top football boots more expensive than low top ones? Generally, high top football boots are more expensive than their low top counterparts. This is the usual case with Nike boots if both come from the same line-up. For example, Nike Mercurial Victory VI is $10 more than its low top version. However, in comparison to other low top boots in a different series such as Nike Tiempo Legend VII, the Mercurial Victory VI Dynamic Fit is way cheaper. 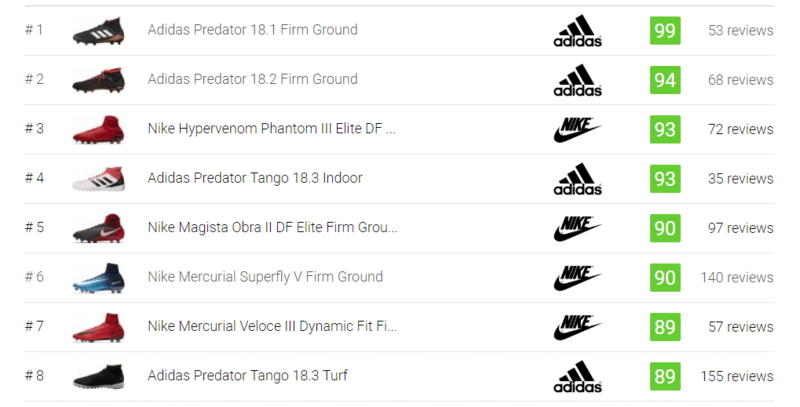 The collared series in Adidas namely the Predator and Ace have the same price range in comparison to other non-collared series such as Nemeziz. Do other brands such as Diadora and Lotto offer high top football boots? Diadora and Lotto do not offer any high top football boots currently. All of the boots available in their line-ups are low-top football boots. Does Puma offer high top football boots? Currently, Puma offers mid top football boots with their Puma One and Puma Future series. The rest of the Puma collections offer low top football boots only. Can I use high top rugby boots in a soccer match? Although some rugby boots are designed to be high top, it is not highly recommended to wear these boots in a soccer play. Some high top and mid top rugby boots are engineered to have ankle straps and collars that can get in between the ball and the foot. More importantly, wearing a shoe not engineered for the sport may cause unwanted injuries.